Color is often cited as one of the most intimidating aspects of designing your own home, but it doesn't have to be. There is any number of tools out there to help you understand how colors interact and blend to create beautiful visual landscapes. The best guide to color is always your own eye, but if you're in need of a little extra assistance, the best place to start is usually the color wheel. Often spoken of in hushed tones of reverence or irritation, the color wheel is exactly what it sounds like; a wheel depicting all of the major colors that are visible to the human eye. While there's nothing threatening about the wheel there are a huge number of ways to look at it, picking out primary, complementary, and analogous colors. Analogous colors are among the easiest to find on the color wheel. Pick any color at any point on the wheel. Then, note any three colors directly to the left or right of it. Together, those four are a group of analogous colors. The name comes from the close relationship that the colors share which is what makes them fitting shades to use together in a space. Analogous color schemes are a common sight in nature, occurring often in plants. The most popular example of a naturally occurring analogous scheme is the changing color of leaves in fall, yet analogous colors can be seen even in the petals of a single flower or in the sky at sunrise and sunset. Perhaps because of the connection with nature, rooms featuring analogous color palettes often have a serene, harmonious feel. When decorating with these colors, it is important to create a balance between the colors by choosing one to focus on. This will be the major color of the room, allowing you to bring in the other shades as accents and small pops. A good place to start when choosing the main color is to select any primary color (red, yellow, or blue) present in your group, using the secondary and tertiary colors as accents. Make sure that you get the most out of an analogous color scheme is contrast. With the colors in your palette so closely related, it's easy for them to blend into each other, resulting in a muddled look that can be visually overwhelming. Fortunately, there are a number of ways to avoid this. Picking a focal color is one; creating a distinction between your colorful pieces with a pattern is another. One of the best ways is by balancing the level of your colors, making small, medium, and large color choices so as to create an even blend of tones throughout the space. 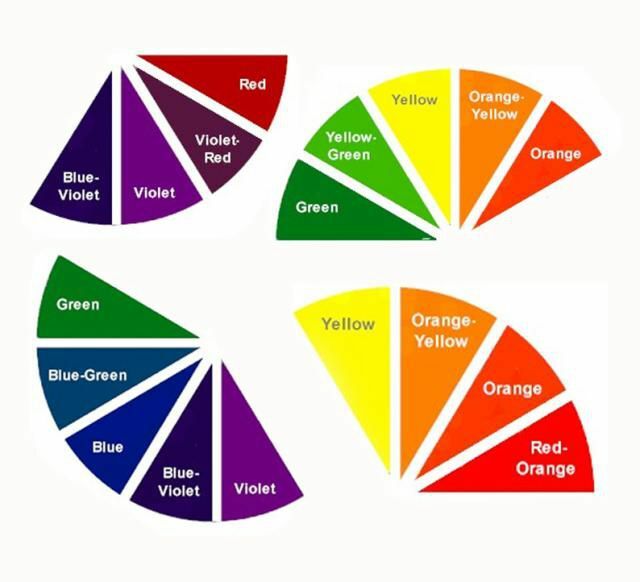 Your best bet, however, is to use some combination of these methods to ensure that, while your colors are analogous, you are not focusing so much on colors directly adjacent to one another on the color wheel (e.g. green and yellow-green) that they are canceling each other out. What is a shade in color theory?